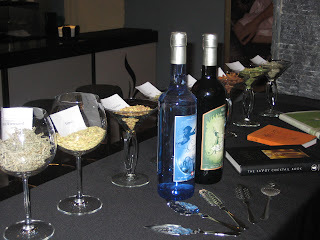 The Real Absinthe Blog: Absinthe for dinner? Having sold and promoted wines, champagne and cognac with food in the UK and in Asia for brands including Krug and Remy Martin, I was always keen to explore the idea of an Absinthe Dining event. There are a lot of misguided pre-conceptions about absinthe, so an Absinthe Dinner could help overcome those and also prove to be a memorable event. In fact, after absinthe dinners in Asia, Europe and most recently the USA, I'm convinced that combining good absinthes with good food works perfectly. 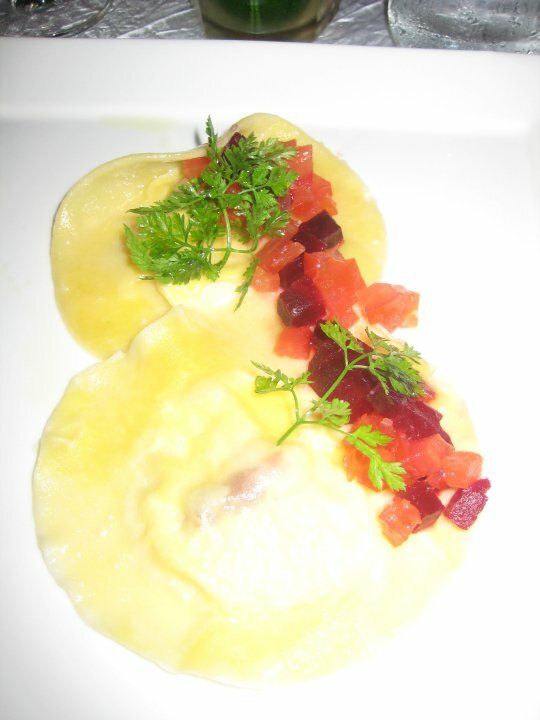 There's something in the herbal mix that goes into good absinthes that makes them a perfect fit with great food. I'm equally convinced that there's NO point in pairing some of the more "one dimensional" absinthes that may just look pretty (artificial colours do that) with the skills of a good cook! 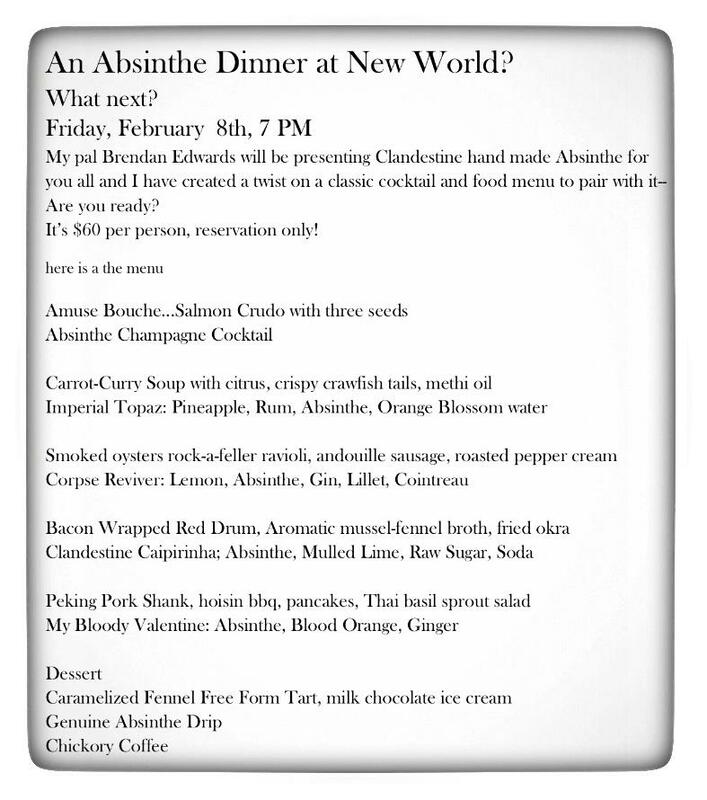 So how should one plan for an absinthe dinner? These notes were originally written for restaurant owners and managers and those organising bigger events, but much of it is relevant for absinthe lovers organising dinner parties for friends at home. Firstly, remember that when diluted with chilled water or in many cocktails, absinthe may be no stronger than a glass of wine. So don't worry too much about that (but, as ever, make sure that people who have been indulging don't drive afterwards). 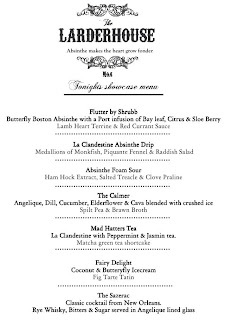 Secondly, note that an absinthe dinner can include both drinks to accompany the food, and dishes made with absinthe. 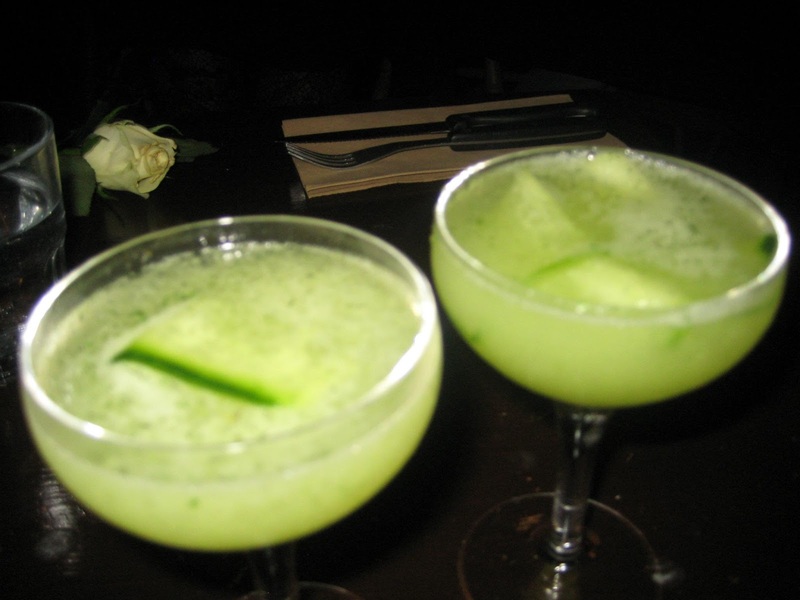 And that those drinks need not necessarily be limited to the traditional absinthe serve or absinthe cocktails. 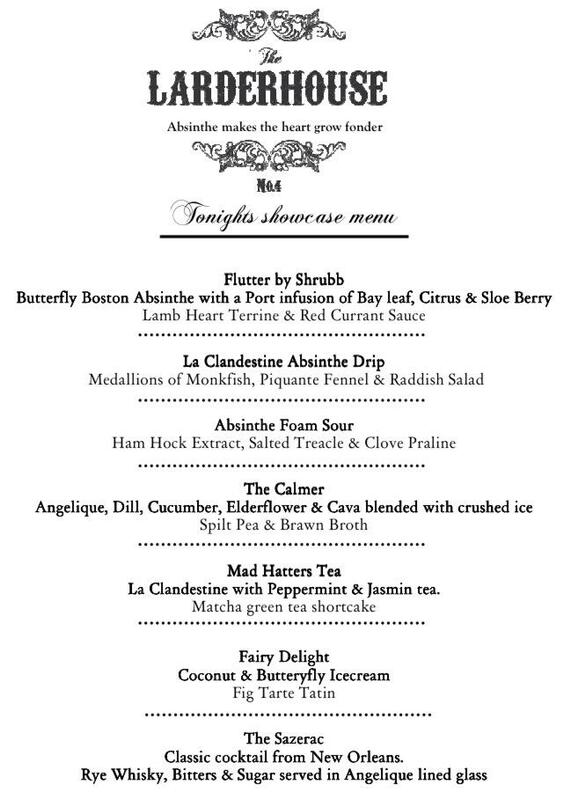 Our recent US dinner focused on a range of absinthe cocktails, both classic and modern, to complement the dinner, and that's a great way to do it. But not the only way, as my UK dinner proved! So what would a typical absinthe dinner look like? If a dinner would normally start with an apéritif, then there are plenty of absinthe options. The Death in the Afternoon above (or a variant) works perfectly, and is a real surprise to those who don't know absinthe well. are an excellent start to the dinner itself, and a small top-up of the Death in the Afternoon can accompany it, if required. There are some good alternatives, using the Rockefeller inspiration, such as the Scampi Rockefeller shown here. 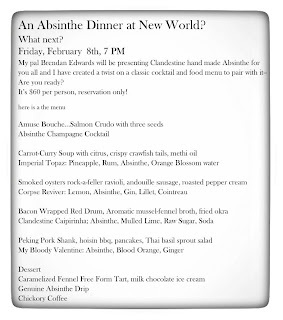 worked well with a Clandestino at this absinthe dinner in Malaysia. I'm not a cook, so I can only report what I've seen - and enjoyed - elsewhere. It seems that the herbal notes of an absinthe (especially the anise, the fennel and the grande wormwood) work especially well with the type of food dishes that work well with those plants. 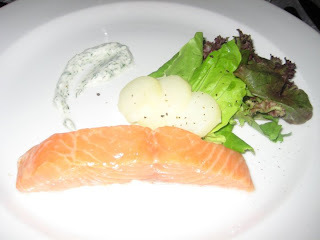 For instance, a salmon dish works well with fennel, so the classic absinthe drip cocktail works very well alongside salmon. served here in the Calmer: Angélique Absinthe, dill, cucumber, elderflower and cava blended with crushed ice. 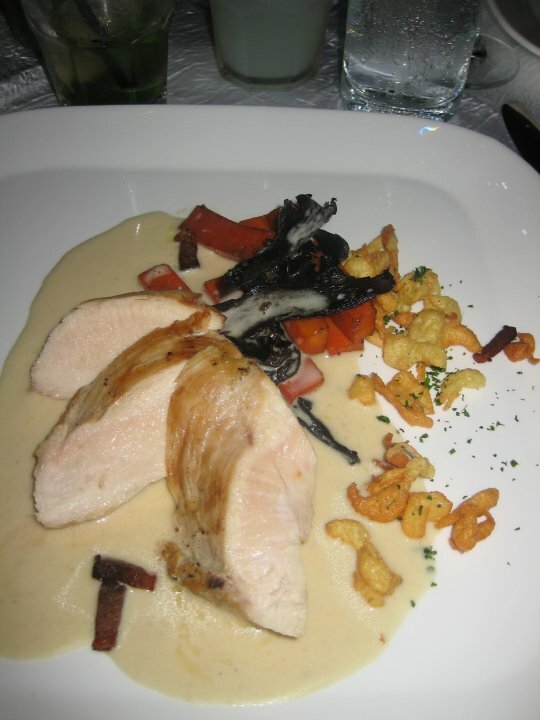 This Casserole de Poulet with pan-fried spatzle, glazed shallot and carrot was accompanied by a classic fountain-served Angélique absinthe. When I enjoyed a Crème Brûlée, as served in the café near the Artemisia Distillerie in Couvet, it was the only time I have seen a Swiss distiller set fire to his absinthe. And it worked excellently. 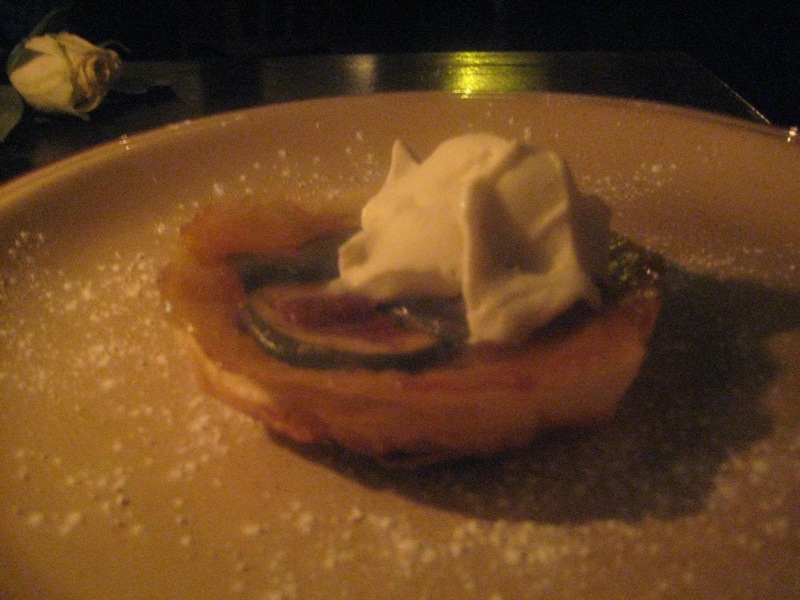 At a UK absinthe event in 2012 we enjoyed Fairy Delight: Coconut and Butterfly Absinthe Ice Cream with Fig Tarte Tatin ..
.. while my friends in Denmark seem to love pancakes made with absinthe egg nog! a pre-made Sazerac bottle to be shared by each couple, with a spray of absinthe added to each glass. Theatrical ... and it saved time since the restaurant did not have to make lots of sazeracs at the end of dinner. And it's a nice touch to have all the plants available and some literature .. Finally, how can an enterprising restaurant manager or owner organise such an event? 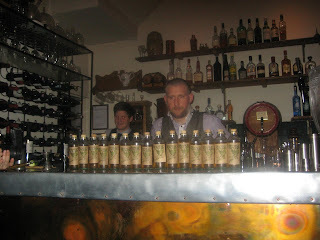 Firstly, talk to an absinthe company that has organised similar events in the past. Ideally try to find a company that can provide some different styles and make sure you have the opportunity to experiment with the products well in advance. As far as price is concerned, consumers do not expect absinthe to be cheap, so make sure you at least cover your costs. The events shown here (UK and USA) were both priced at around $ 60 (plus tax). Click on the photos to see the menus more clearly. Finally the menu from a series of dinners held at London's Gymkhana Restaurant in 2015: this was priced at £120 per head. There are a few more absinthe and food suggestions shown on this ever-expanding Pinterest board. Hopefully there will be many additions to come. And I would not be at all surprised if after future dinners I get the same reaction and feedback heard already. 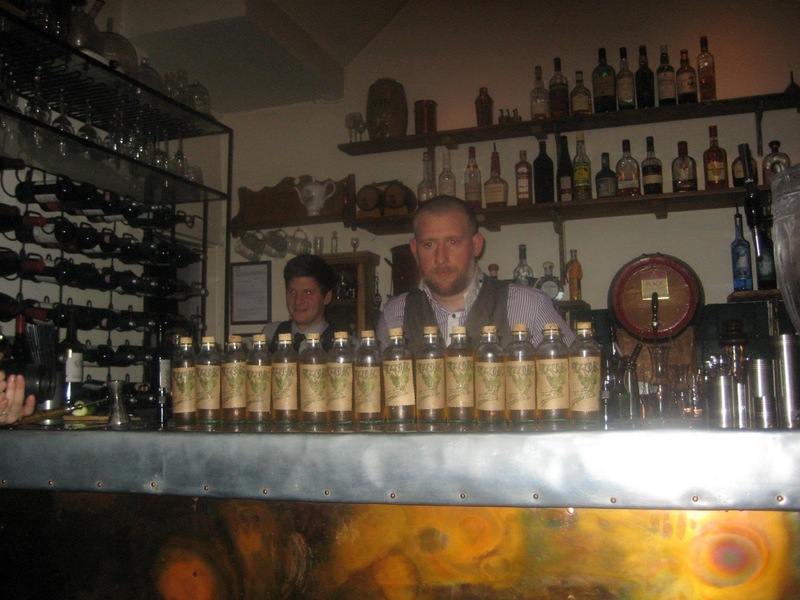 "I never knew you could do so much with absinthe," "That completely changed my view of absinthe," etc. In the meantime, santé and .... bon appétit! Pernod Absinthe: "The Original Recipe"